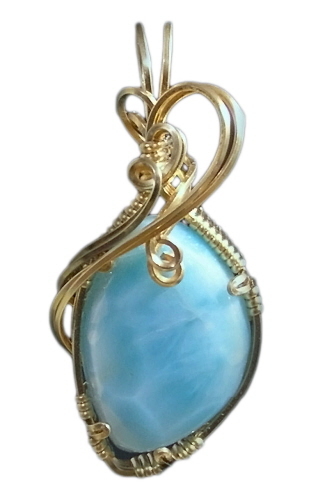 This natural larimar gemstone, cut into an asymmetrical shaped cabochon, measures 24 mm x 13 mm. 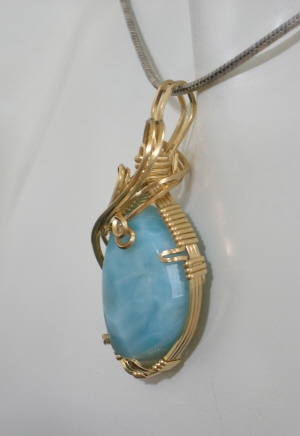 The blue pattern in the stone is reminiscent of the waters of the Caribbean. 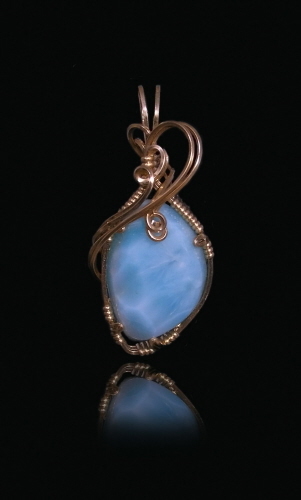 Wrapped in 14kt rolled gold wire in a prong setting. Finished size is 47 mm x 21 mm. Weight 0.4 oz. A rare blue variety of pectolite found only in the Dominican Republic, in the Caribbean. It's coloration varies from white, light blue, green-blue to deep blue. The blue color is photosensitive and fades with time if exposed to too much light and heat. Energy radiating from larimar represents love and healing.